Coffee With Hallelujah: EXPRESSING SCIENTIFIC OBSERVATION PASSIONATELY: InterPlay provides the methodology! EXPRESSING SCIENTIFIC OBSERVATION PASSIONATELY: InterPlay provides the methodology! At sunrise, juvenile alligator tracks lead us nearly half a mile behind the dunes before they suddenly halt at the shrub line leading into the maritime forest. The winds are rising and dusting our trails that followed behind this top predator of the Georgia barrier island. My husband, Tony Martin, and I stopped to wonder out loud, "What had brought this three-year old alligator out of its freshwater pond for a walk about along the coast?" and "Where was it going next?" Being curious and wondering out loud is part of storytelling skills, according to Jon Young in the book, "Animal Tracking Basics," that Tony is using for his freshman seminar class at Emory. Titled "How to Interpret Behavior You Did Not See," this course has 18 university freshmen choose designated "sit spots" in natural green spaces around the Emory campus, keep tracking journals in which they have "mapped" their "sit spots," and learn how to recognize, name, and understand the animal behavior they discover. Another aspect of the course is storytelling! That is where my life, the wife of the scientist, enters the Emory classroom of animal tracking students! Ta da! I'm an educator with 25 years plus experience, artist, and, yes--animal tracker. I have been tracking with my "ichnologist" husband for the past 13 years. In addition to these skills, I have been adding a new one to my belt--improvisational ones via the methodology called InterPlay. But I get ahead of myself...first what is "ichnology"? 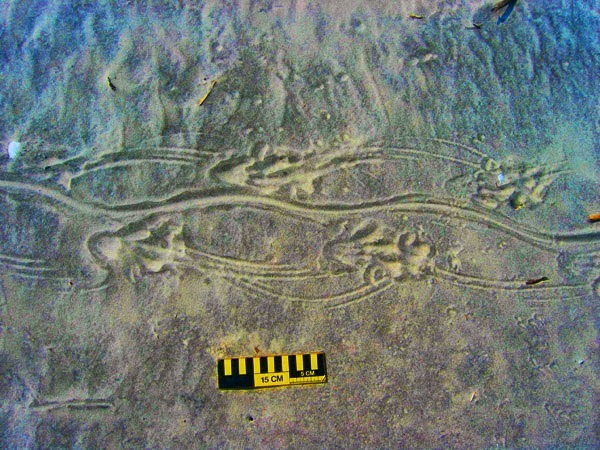 Ichnology is the study of traces of animals behaving--making their tracks, trails, burrows, feces, gnawings, and more. You can study animal behavior occurring today or that which occurred in the past, even millions of years ago. Tony has done both in two very different books: the modern in Life Traces of the Georgia Coast, and the ancient in Dinosaurs Without Bones. My husband is both expert at interpreting behavior he did not see the animal make and at writing stories about that behavior. This spousal storytelling behavior has been ongoing in our household without my "interpreting" it as STORYTELLING! I thought of his book writing endeavors as something academic, something distant from every day life, something scientific and meant for a specialized group of readers. A light bulb went off for me this past week after volunteering to teach two of his 50-minute freshman tracking classes this week while he is in Berlin for a Society of Verterbrate Paleontologists conference. Reading the "Storytelling" chapter in Animal Tracking Basics, caused fireworks in my artist's brain. Kaboom! Ohhhh! Ahhh! Suddenly, I experienced an integration of my life with Tony. Suddenly, my writing skills, my image making moments, tracking animals with Tony in various countries such as Australia, Guatemala, Bahamas, and the United States, and the improvisational tools of InterPlay sizzled, popped, and merged! I could teach students how to express their scientific observations passionately using the methodology of InterPlay! He even goes on to add juicier motivations for telling stories about the animal tracks we see. In doing so, we develop a passion for living and learning. We laugh and live more fully in the moment! Hurray education for life! But how to move students from the artifacts? The notes and sketches in their tracking journals into experiencing this enlivened state of being? One must have a methodology! Jon Young suggests researching folk tales and information about the animals and listening to elders' stories. And to wonder. To ask questions. How wonder full! But then how to get students to "enact" and "embody" this gathered content? InterPlay has forms and tools for expressing content such as scientific facts in an enlivened and full way. Here's how I did it with a little help from my InterPlay community (Thank you Phil Porter, Jennifer Denning and Lynn Hesse)! First, after warming the students up with physical activity and learning their names, I used one of the most fundamental forms of InterPlay--babbling! Babbling is an improvisational form that builds from one sentence statements about possibilities for telling stories to 30-second stories, to 1-minute and longer stories incorporating variations in the way a person communicates those stories. telling a story about a "sit spot"
speaking from a different point of view of animate or inanimate object in their "sit spot"
In incremental steps, I introduced variations the students could use to begin to "embody" their stories. For example, I asked students to play around pausing, stopping, and elongating words. They noticed that by doing so, their listeners grew more interested in what they were going to say next. Pausing or stopping also gave them time to think about what how they were going to continue their story. Then I had them experiment with telling a story about a mundane topic such as walking to class or washing clothes with great enthusiasm. This activity engaged them in playing around with volume, pitch, and speed. They also noticed that they began using their faces and gestures. 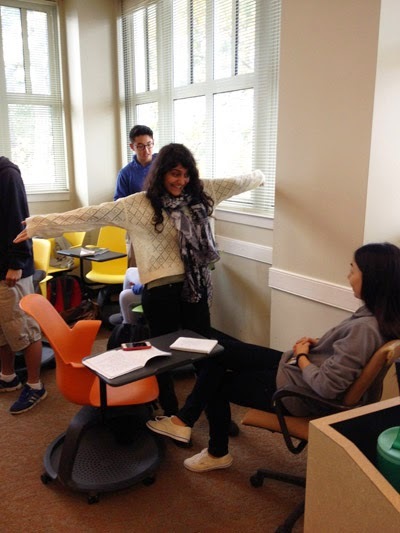 Finally, in this short 50-minute class, I had the individual storytellers stand up to tell a story from the perspective of an animal or something else that they had observed in their "sit spot." They were invited to integrate pausing, stopping, speeding up, and enthusiasm in their presentations. Some students definitely grew more animated and invested in how they were telling their stories. On Friday, November 7, I shall return for one more adventure in engaging tracking students to embody their scientific observations. Let's see what else we can play with to have fun telling stories from our observations of nature. Stay tuned! That's Coffee With Hallelujah. SOUL BLOG with me and tell me about your STORYTELLING SKILLS! When You Write about Traces, Does It Make a Sound? 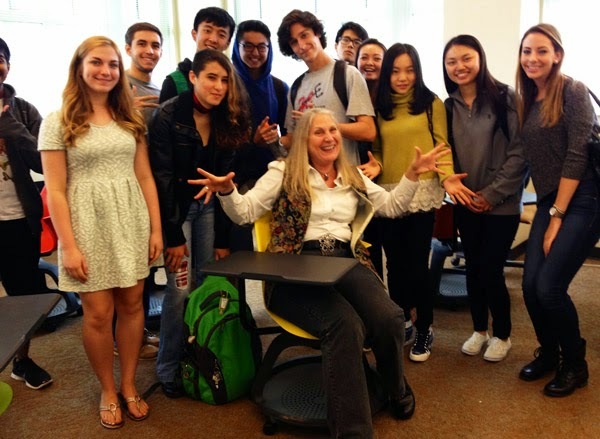 Darlene, it has been exciting to "blend" my skills and to have the opportunity to teach Tony's Emory students. I appreciate your acknowledgments in the way we have enriched our students' lives. This sounds like so much fun. I love storytelling and telling stories. What a gift you gave these young scientists! Thank you Linda! One of the most wonderful gift is teaching and how it reinforces what we know and moves us forward to learning from our students. Hi Ruth - What an incredible discovery for your marriage. It sounds like you have found a little nugget of something new to love about him. I loved this post. I love animals and nature. I've read Grandfather and it gave me a whole new appreciation for tracking. How fun to discover this post on Inspired Blogging! Amy! You got an important part of my blog entry! I love how my creativity intertwines with my marriage and the way my scientist husband uses his imagination to communicate about what he knows. Then to begin to see how I can step into the scientific knowledge I've acquired and own it for myself--perhaps through story tellling! Kama it is so much fun to keep discovering in the area of one's own being! How awesome to find new avenues, new openings, and new companions! Being curious and the art of storytelling make for a wonderful experience. How fun for us to be on the journey with you! Go Ruth! Just love this. Lets put this on the InterPlay page. Also can we make a doc to share in InterPlay Academy?